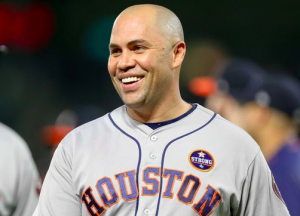 On the heels of winning his first World Series ring in his 20th major league season, Carlos Beltran is calling it a career. Beltran announced Monday that he’s retiring from baseball, allowing him to go out on top after helping the Houston Astros win a world championship. After what Beltran has accomplished over the past 20 seasons, it may be a short five-year wait until Beltran earns an invitation to Cooperstown. “I am blessed to have played this game for 20 years,” Beltran wrote in a statement. “I am blessed to have played for so many great organizations. I am blessed to have shared all of my experiences with my wife and my three kids, my family and friends. Beltran is undoubtedly one of the finest players to ever come out of Puerto Rico. He broke into the league late in the 1998 season with the Kansas City Royals and soon became one of the bright young stars in the game. But it was a trade to the Astros in 2004 that made him a household name. During the 2004 postseason, Beltran hit .435 with eight home runs in 12 games. It was arguably the greatest postseason performance of all time. He turned that epic postseason into a massive free agent contract with the New York Mets. He spent six and a half years with the Mets, having some of his best seasons while playing in New York. Of course, after leaving Houston in free agency, Beltran became a hated figure among Astros fans for many years. However, Beltran made it up to the city of Houston when he returned this past season. Even at age 40, Beltran proved that he could still play. Beltran contributed 14 home runs and 51 RBIs to the Astros in 2017. Those numbers and his veteran leadership during Houston’s World Series run helped put Beltran back into the good graces of Astros fans. When all was said and done, Beltran was a 9-time all-star, 3-time Gold Glove Winner, and 2-time Silver Slugger winner. He was also American league Rookie of the Year in 1999 and a member of the 30/30 Club during his epic 2004 season. For his career, Beltran hit .279 with 435 home runs, with an OPS of .837. When you consider he did that over the course of 20 years and was still playing at age 40, those numbers are quite impressive. How Beltran spends his retirement remains to be seen. But there’s a good chance it will involve baseball in some way. In 2009, he founded a baseball academy in Puerto Rico. He could choose to become more involved in teaching younger players. He’s also expressed a desire to become a manager one day. Whatever Beltran does in baseball from this point out, it’ll be tough to top what he’s done over the past 20 years. Monday marks the official end of a long and brilliant career. The game will surely miss him in 2018 and beyond.